PMC Twenty 26 review | What Hi-Fi? We’re big fans of PMC’s Twenty range. 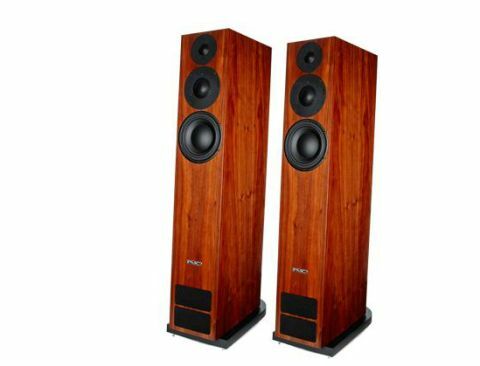 The two middle models in the series, the 22 stand-mounter (£1970) and 23 floorstander (£2300) have been regular Award-winners in recent years and are in with a decent shout of repeating the feat yet again this time round. The newly-introduced 26 sits well above those two in price and, we’re glad to report, in performance too. Like the rest of the range, these floorstanders look a little odd when you first see them due to that sloping cabinet. The slope isn’t just there to grab your attention either; it’s claimed to make the cabinet more rigid and reduce the build-up of internal standing waves. This is the first three-way Twenty model. A standard Twenty series tweeter handles the highs – it’s a drive unit co-engineered with the highly respected OEM manufacturer SEAS. It uses a 27mm soft dome made of a fabric called Sonolex. The tweeter’s grille doesn’t just protect the driver from prying fingers; it also helps sound dispersion giving a wider, smoother off-axis response. The dome midrange driver is the star here. It’s a 5cm coated linen design that builds on the units PMC has long used in its more upmarket offerings. This dome covers a wide frequency range, from 3.8kHz right the way down to 380Hz, meaning the all-important midrange area – where our hearing is at its most sensitive – is covered by just one driver. This approach moves the phase issues and other shortcomings innate in any crossover network to frequencies where such flaws are less critical. A hefty 18cm driver – designed specifically for this speaker – delivers bass frequencies. It uses a stiff, damped natural fibre (otherwise known as treated paper) cone with rigid cast alloy chassis and a vented magnet assembly. Together these things help with detail, dynamics and power handling. The output from this bass driver is augmented by PMC’s trademark transmission line system. The company has been honing this kind of bass tuning system for years and gained considerable success, delivering deep, clean low frequencies from smaller cabinets than you might expect. A three-way design has innate advantages. Each drive unit can be optimized for the frequency band it works in, which should lead to a more revealing sound. Power handling is improved over two-way alternatives too, but the addition of an extra crossover – between midrange and bass – makes it harder to achieve a truly seamless balance throughout the frequency range. Rhythmic precision tends to suffer too. Still, with PMC’s experience you’d hope these difficulties would be overcome. Build quality is as good as we’d hope for. The 26’s cabinet is solid and smartly finished. There’s a choice of four finishes – the amarone of our review sample, along with oak, walnut or diamond black. The finish is smart regardless of option chosen. A sizeable plinth has to be attached to the base of the cabinet with some sturdy-looking Allen bolts. Unusually, the plinth is separated from the main cabinet with hybrid cork/rubber spacers, which provide a degree of decoupling. The company claims improved bass definition and greater high frequency focus compared to the conventional solid approach, which rings true in use. Be careful not to do up the plinth bolts too tightly otherwise the decoupling effect is reduced – aim for fairly tight rather than lock-down rigid. Any speaker at this kind of level needs great electronics to sing, and the Twenty 26 is no different. We used our reference system of Clearaudio Innovation Wood-based record playing package, Naim NDS/555PS streamer and Bryston BP26/4B SST2 pre/power amplification. In this system, the Twenty 26s shine. Some products take a while to get under your skin, but not these. We like them straight away. They’re beautifully balanced, from a tonality that’s as even as you like to a combination of attack and refinement that’s class leading. Play a piece of music like Lorde’s Royals and it’s hard not be impressed with the 26s’ low-end power and precision. There’s a fine sense of weight here, yet these speakers have no trouble defining the texture and reverb of the bass notes too. Lorde’s vocals are rendered superbly. There’s a massive amount of detail through the midrange and a lovely display of low-level dynamics that help make the most of her distinctive, engaging vocal delivery. Move onto something more dramatic - such as Stravinsky’s The Rite of Spring - and these PMCs continue to impress. Here, their dynamic reach stands out, as does the way they maintain composure when the piece becomes complicated. The 26s’ even tonality helps instruments sound convincing and the floorstander’s carefully honed dispersion characteristics mean wide, expansive stereo imaging without too much effort. The stereo image is well projected and far more detached from the speaker enclosures than it normally would be for such sizable cabinets. That quality points to a well-behaved cabinet structure that doesn’t impart too much of itself onto the music. Perhaps most impressive of all is the way PMC has managed to engineer such a seamless sound from the three-way design. The drive units really seem to work as one, delivering a consistent character from the lowest bass notes upwards. We’re happy with the agility of these floorstanders too. Despite delivering a sound of pleasing weight and authority they never sound slow or unresponsive. These are lively, entertaining speakers that are refined enough to allow you to enjoy poor recordings yet transparent enough to allow the best material to shine. We come back to that word balance. While we’ve heard even more revealing high-end floorstanders (including those from PMCs more upmarket Fact range), very few have delivered music in such a likeable way. This is an all-round package that’s very hard to pick holes in.